Lily turned 4 years old last month and we had such a busy time generally. December, January and February is birthday season in our families so that means lots of present buying, card writing, wrapping and going to parties. What made it easier for us this year with Lily's birthday was the "Ariel Beautiful Mermaid" party pack for 8 from Party Bags and Supplies. I chose the Ariel themed pack as Lily does love Disney's Little Mermaid and I thought it would go down a treat, which it absolutely did. So what was included in the party pack? The Ariel-adorned single-use plastic tablecloth brightened up our table and provided the perfect backdrop to the rest of the underwater themed party essentials. 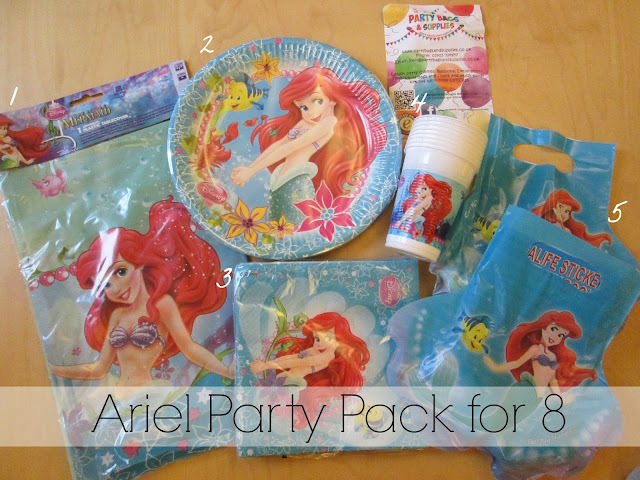 Eight medium-sized, child friendly paper plates which features the same Ariel design as on number 3 - the plastic cups, with slightly different Flounder and Sebastien, along with some sea-flowers. The variation adds a bit more interest; not everything has the same print on it which is good. Sixteen soft paper napkins, which of course are always vital at a party, at the ready to wipe away buttercream, cake crumps and pizza sauce. These napkins featured Ariel in front of an open clam shell with a blue background and a floral design. Now let me focus a bit more of number 5 because these are the exciting items of a children's party, especially for the children if not so much for the adults. I'm talking about party bags! I didn't have the opportunity to get stuck about what to fill the party bags with as the party bag came complete with eight of them. The party bag itself is scallop shaped which fits in very well with the underwater Ariel theme and inside you will find 5 items. In ours, Lily found a bright piece of rubber jewellery, so she has been waving her hands around showing off her new ring now as well as her beaded bracelet. There is also one sweet treat; a Lovehearts lipstick, a springy sea-creature and a Sea Life activity and sticker book which could serve well as a rainy day activity. It does seem that this party pack is targeted to little girls, but if you wanted to put something in extra to suit the boys in your party then do so, and don't forget a slice of birthday cake! 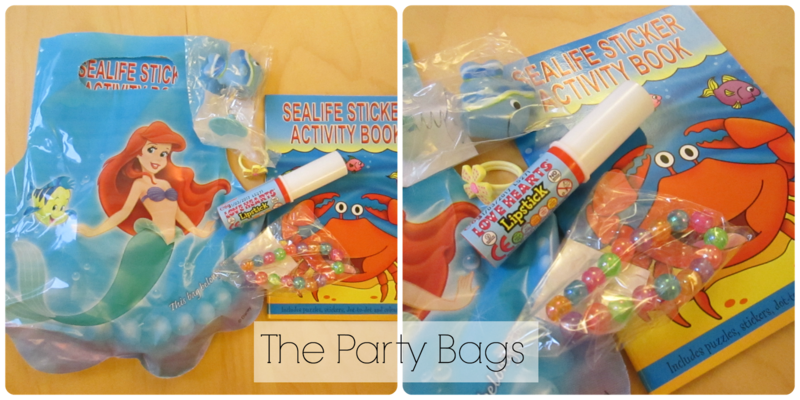 I have now got lots of ideas for Alexander's second birthday in July and I hope the planning will go as smoothly as Lily's did thanks to the Ariel the Mermaid party pack from Party Bags and Supplies.